Oak Tree Clinic opened its doors in 1994 as the only HIV clinic in Canada catering specifically to the needs of women and children living with HIV. Based on the recent paper “Women living with HIV envision women-centred HIV care” the clinic is the model that Canadian women living with HIV envision: it provides high-quality HIV care, integrates women’s health care, addresses the social determinants of physical and mental health, and provides holistic HIV women-centered care alongside four women’s peer-support groups. Among their many accomplishments, Oak Tree has succeeded in preventing perinatal HIV transmissions for pregnant women engaged in Oak Tree Clinic care and who have been on antiretroviral therapy for greater than four weeks. There has been no HIV transmission from mother to child for 20 years! The clinic cares for women all along their life span- from delivery to youth/adulthood/ and aging. The interdisciplinary team has also recently expanded the scope of care to provide Hepatitis C Virus (HCV) care and HCV cure to their HIV/HCV co-infected clients. This year ten patients were cured from HCV, and a further five currently receiving treatment will be cured in early 2018. 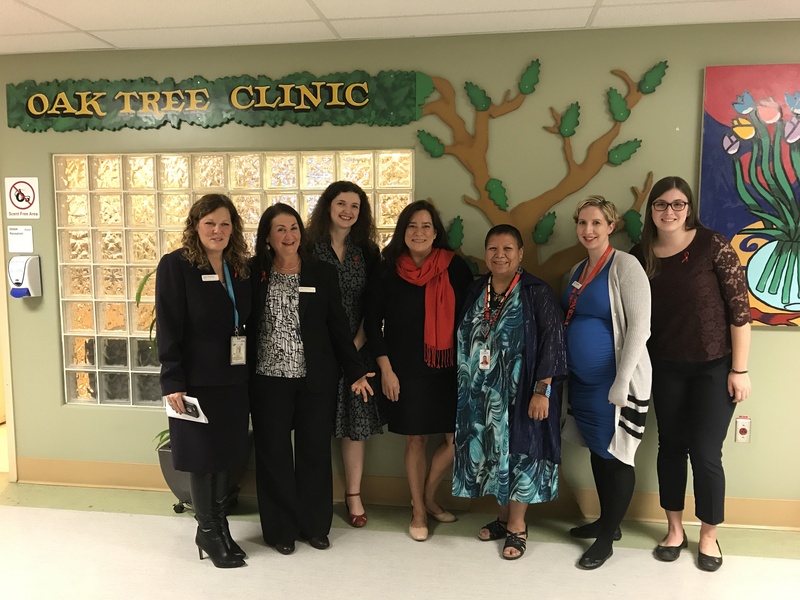 In advance of World AIDS Day, Minister Jody Wilson-Raybould visited Oak Tree Clinic to meet the clinic staff, a patient, and speak with Amber Campbell, a Research Assistant who participated in the Canada Summer Jobs program (a summer program for students interested in research). Amber has recently been working alongside Dr Melanie Murray on the CARMA-2-CORE study to investigate the comorbidity and polypharmacy among women living with HIV (WLWH) in British Columbia. This work is essential, as HIV-positive persons are living longer and comorbid conditions and concomitant medication use are increasing. Research has been described in several, mainly male cohorts, so understanding the burden of comorbid chronic diseases and associated treatments among WLWH is beneficial for care optimization and to improve the lives of WLWH. Amber continues to work on sorting through the diagnoses and medications reported by the study participants in order to see if WLWH obtain appropriate treatment of comorbidities, and the team hopes to present some of the preliminary data at the 2018 CAHR conference in Vancouver. They will also be writing and submitting a manuscript to a journal in the new year. In addition to this study, Amber is working on the WelTel project which explores the role that text messaging can play in improving the health of people living with HIV. The team is currently working on building relationships with local Indigenous communities to ensure that the study is acceptable, safe, and of help to Indigenous persons. These relationships will help shape the project, and will examine the ways in which they may determine who would benefit most from the text messaging program – and why – so that they can provide personalized care for those struggling with medication adherence. The Oak Tree staff is leading some HIV women related guidelines, provincial and national, as well as work on many research projects. Participate in the HIV/HCV co infection Canadian cohort, which is the largest cohort for co infection currently, with over 1000 participants, about 120 have been enrolled from the clinic. Research led by Dr Money, “Defining the maternal legacy: Does mode of delivery impact the role of the maternal vaginal microbiome in predicting the infant gut microbiome?”. Previous Previous post: WHRI Annual Toy drive: a gift exchange with a twist!